Given my lead in development in this game, the presence of an advanced pawn on the 5th rank and the arrangement of the pieces toward Black king, I think that an immediate kingside attack is justified. In the game I ended up playing a move which I do not like very much now that I think about it (6.Bg5). However, thinking about it now, I believe it would be best if I had started playing g3 with the idea of defending the knight in my next move (Nh4) as well as to support an upcoming advance f2-f4. However, Stockfish seems to prefer to slowly manoeuvre on the other side of the board with b3, Nc3... but all of these moves seem to ignore White's lead in development. I can see that moving my pawn to b3 will eventually allow my light-squared bishop to be placed on d3. But I believe that is too slow. Why is a kingside attack not justified here? There is no king on the kingside yet to attack. Black might very well castle long in which case your attack is aimed at nothing and might potentially weaken your own king's safety. 5....c4 is premature and unnecessary. It loses the pressure on the d4 pawn and loses a tempo for development. A very typical reply to such pawn structure is b3, which is based on the fact that black cannot stabilize the pawn on c4 as after 7. b3 b5 8. a4, a6 is not an option because of the potentially hanging rook on the a file (after axb5 axb5). The situation would be different if black had for instance already played Bb7 which would defend the rook. So all in all, b3 is a natural plan, which will in the short term weaken black's pawn structure and give white an advantage. The other option, kingside attack, with f5 eventually is not bad per se, but you should probably wait until black has castled short. Also it takes a lot of moves to get any kind of attack going. Because the center is closed. You need to start by undermining black's center pawn chain. That means either the e6 pawn, the c4 pawn or both. The computer's suggestion of b3 undermines c4 immediately and makes a lot of sense. Undermining e6 will take a lot of moves by which time will likely be much better developed and prepared. Because Black is much less well developed and his king is still in the middle while your king is safely castled kingside your best plan is to open the center first. It will be very hard for black to survive. I believe white has to strike now on c4 pawn otherwise black can consolidate the position of that pawn. As it stands with b3, b5, a4 black cannot maintain his structure with a6. I'm not sure why you would consider g3 or Nh4, it has no squares to go to. g3 weakens your position for pretty much no reason. Even with a bunch of free tempos it accomplishes nothing. Like if your knight was on h4, pawn on g3 and pawn on f4 in this position, you still can't push f5 and if bg4 it can easily be stopped with nf5 or g6. You would need to play g4, which does nothing against ng6. If I truly want to attack the king side, I would be looking for moves like Ng5 and f4. I think your position is better, because you have many possibilities here. The move b3 does a lot of things. It immediately asks black a question — he can't really afford to allow bxc4 dxc4 Bxc4 and the response b5 fails to a4 since a6 is impossible. It's not that a kingside attack is not justified. Actually, it's in the air. With a pawn on e5 and a space advantage on the kingside, you definitely have the possibility for a kingside attack. The closed center actually helps you achieve this. But you shouldn't always confine yourself to playing on one side of the board. The move b3 will help you on both sides of the board, so it's worth playing first. There's a good chance black will play cxb3 here, which as you point out frees up the d3 square for the bishop, and might contribute to a future attack. It also allows you to play Ba3 and possibly trade dark squared bishops, weakening the dark squares like d6 and even f6, which could be suitable for a knight. If black plays cxb3 you also get some pressure on the a-file, and the b5 square could be occupied by your knight. Castling long seems a bit suicidal, especially after b3 cxb3 axb3, when you have an open a-file and the a6-f1 diagonal. Thus black will probably castle kingside. While you do have a lead in development, it's true that the center is closed, which makes your lead in development a little less dangerous. Your pieces aren't on very aggressive squares right now, either. I think your biggest advantage here is actually your space advantage, with pawns on d4 and e5 that are difficult to challenge. The move b3 threatens to increase your space advantage and your piece activity, as it might give you the d3 square and/or an open a-file. Instead of cxb3, it is worth considering the alternative Ba6. Black is threatening to trade light-squared bishops with cxb3 axb3 Bxe2. This would be undesirable, as your light-squared bishop is better than his. But maybe bxc4 Bxc4 Bxc4 dxc4 c3 is good for you. You lose your light-squared bishop, but now you're threatening Qa4+, and if black plays b5 you have a4. If black plays Qc7 then you have Nd2, and you are still threatening Qa4+. Also you have access to the e4 square. 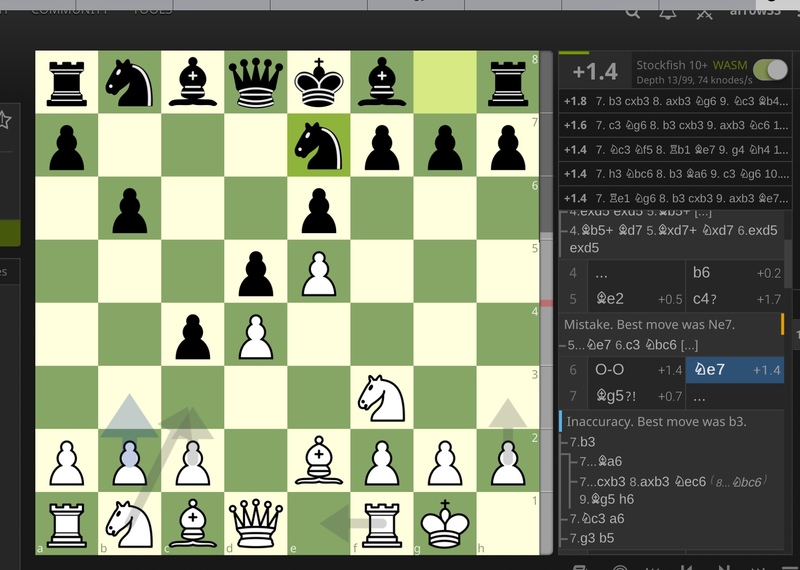 In lines like these, your lead in development could be more useful on the queenside than the kingside (since there is immediate pawn tension on the queenside). In the Damiano Variation of Petrov's Defense, should white play d4 or f4? How to survive a Kingside Attack in Chess? Why I can not improve in chess & why I can not see the things?